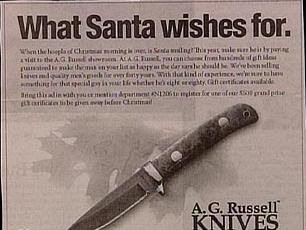 Santa wishes for a knife? Really? What on earth for? I hope they are not saying that Santa needs protection. Or that he has some bad plans for all those naughty kids. AG Russell knives. Hmm, i dont really like your advertising strategy.